You have been working in restaurants as a day job for a few years now. Tell us about that experience. It revealed to me the complex organizational systems, of both the people and the utilities required that operate throughout culinary infrastructure, and how such combinations of individuals and supports of the setting are organized for efficiency, high performance and speed. Moreover, it assists in understanding how certain factors contribute to the formation of the archetypal ‘insane chef’. I feel as though the high-pressure mantra of ‘the push’ is significant, as a driving force, which necessitates a continual challenge against perceived physical limitations. With a longstanding interest in technology, the specificity of a gastronomic context hosted a keen study of specialized culinary equipment, obscure alchemic cooking methods and to what ends these are applied in high-end restaurants. I think also my childhood obsession with gizmos and gadgets has affected how I deal with extremity of gastronomic culture in my work—fixating on specifics, deconstructing mechanisms and then recreating them through a ‘hack’ methodology has been the kind of curiosity which forms the base for several of my works. For example, in learning about sous vide, I built an immersion circulator using an aquarium bubbler and a fish tank temperature controller. More recently though, after working 10 days at a ramen pop-up venue, I became interested in this idea of the experience economy and the particular kind of hype attributed to transient businesses and gastronomic settings. Perhaps too, the hype surrounding the ramen pop-up, and around gastronomic culture in general for me seems to operate similarly to the early stages of Modernism—as opportunities for the ‘new’, ‘exciting’ and ‘memorable’. How do you relate to the work of artists like Daniel Spoerri, Rirkrit Tiravanija, etc? And the restaurant experiments of Gordon Matta-Clark, Allen Ruppersberg, etc? Would you open your own restaurant? I feel as though there are similarities, but I tend to see my work as the anti-social younger brother. For example Tiravanija’s work from the onset aims to generate social interaction and foster human relationships. However I feel like I’m trying to work towards a one-on-one psychological engagement with the viewer, playing on the potential to trigger a sense of nostalgia or flashes of memory on a level that is unique to each individual, which is, moreover, a strategy used in contemporary gastronomy. Although, aesthetically, I am fond of his ad hoc and temporary set ups, as it feeds into my interest in growing gastronomic trends such as pop-up shops, food trucks, etc, which are all pretty commonplace within Melbourne. In some ways too, I feel like Matta-Clark acts as a precursor to these trends. The performativity of something like Matta-Clark’s restaurant ‘Food’ is particularly interesting in the way that its ideas have perpetuated through concept restaurants like El Bulli, The Fat Duck and Alinea, which incorporate performance acts like cooking tableside, the use of dry ice and liquid nitrogen within the restaurant setting. In this sense, I feel it has become a new kind of theatre for the new bourgeois, in that it has a rehearsed practice for a ‘spectacular’ and ‘magical’ experience. I also like Matta-Clark’s idea of making inedible food and I feel like it correlates in an interesting way with the way contemporary gastronomy has shifted the focus towards the conceptual and the philosophical in presenting their dishes, to the point where complete inedibility seems plausible. But to what extent does this matter? I feel reading Matta-Clark points to such an absurdity present now in gastronomy. In terms of opening a restaurant, I feel like the whole ‘artists-running-restaurants’ thing has potential, whilst there are similarities between my artistic and gastronomic processes, I also feel, through realizing the scrap, ad hoc nature of my creative processes, that I would completely fail at the coordination and logistics demanded by such a position. Although I would consider making my own pop-up restaurant, after having worked closely with local Pat Breen on his Shophouse Ramen popup project, something like a permanent establishment is not on the radar. You are developing a machine, which will create tasteless popcorn while diffusing the smell of melted butter. How does that aspect of deceitfulness play into your interest in sensation as a trigger for nostalgia? Is it as if Proust’s Madeleine had no flavor? ‘Deceitfulness’ presents connotations that I wouldn’t necessarily figure in my practice. For me it conjures ideas of scamming or deception, whereas I’m trying to utilize a more playful duplicity of senses, trying to prompt a more lighthearted reaction. Olfactory sensations are strongly connected with memory, and it is interesting that while the melted butter smell when diffused has quite a sweet artificial pungency, it still triggers an association with popcorn. I’m currently working on making a fully automated popcorn dispensary system, but funnily enough it still requires artificial means to actually prompt these associations. I find the smell of popcorn has a strong nostalgic attachment for a lot of people, and the prankster move of suggesting flavor with scent I see as a reflection of the multi-sensory quality of memory, and am thus aiming at presenting as many opportunities for senses to be crossed as I can. Whilst Proust’s Madeline’s memory is led by taste, the popcorn machine seeks to present the viewer with the tug of several sensations and associations, drawing upon the ritualism inherent in high-end gastronomy. What these restaurants do is align memory with the totality of dining experience rather than a single sensation, and I’m hoping to question what the effects of targeting multiple sensations has on the way memory comes to be manufactured. Last week Restaurant Magazine announced El Celler de Can Roca in Girona, Spain, as the world’s best restaurant. What do you consider the world’s best restaurant and if you had the opportunity, what would you discuss with the chef of El Celler? I was surprised to see Noma knocked off the top spot, considering the shift in recent years from molecular gastronomy to nature-based cuisine. Although I do feel like nature-based cuisine essentially builds on foundations laid by molecular gastronomy. Places like Noma and Quay still use many of the techniques and specialized equipment pioneered in the molecular movement. I find El Celler de Can Roca holds a certain resemblance to El Bulli, in its way of using science to generate playful experiences. With Joan and Jordi of El Celler, I would be interested in discussing the processes undertaken to form their cuisine. Does it start with technology and techniques? Or does the memory or concept form the foundation from which to proceed? Regardless, I find the process of ranking restaurants inherently problematic, as applying a ranking system has its limitations on how we perceive their importance in their respective locations, cultures, approaches and practices. I also feel like flagging a ‘world best’ inhibits creative potential in some ways, as it informs a standardization or homogenization of discourse. Establishing an ideal platform of quality and status prompts a status anxiety, which then induces trends, which in themselves limit the possibilities of a more varied gastronomic field. If here, we are considering the elusive notion of ‘innovation’ as the main criteria of judgment, I feel as though Alinea should take a spot as one of the best restaurants in the world. I see Grant Achatz pushing the limits of technicality to the point of generating distinctly innovative ends. For a few years there, when El Bulli was top dog, there was a noticeable replication of the molecular gastronomy techniques practiced by Ferran Adrià. This happened for example, in Melbourne about seven or eight years back, when a local chef created copies of dishes from Alinea and WD-50, and it is these kinds of plagiarism that come with placing restaurants on a pedestal, which concern me somewhat, despite it being unavoidable. I feel like a more personal approach to cuisine, rather than relying on external criteria of status, is required. Some of the world’s best restaurants are relatively inexpensive, while some others are out of reach for almost anyone. What do you think of the correlation between price and quality when it comes to food? I think there is definitely a kind of elitism within high-end gastronomic culture, with the correlation of paying more with ‘experiencing’ more implemented as a kind of blurry measure of quality fueled by the experience economy, and certainly this is significant in determining worth or status like we just discussed. However the issue here is that the high-end settings hold a very inflexible standard of what a ‘proper’ memorable gastronomic experience is, and they reiterate a fixed belief that simply ‘experience is memorable’. Yet, this still manages to spawn a market through a growing pool of food bloggers who attach to the experience as a social status symbol. I personally find that more accessible, informal settings like Momofuku, Milk Bar and Ivan Ramen provide a much richer experience, perhaps because they allow for the diner to enjoy their food without the overbearing pretense of the solemn fine-dining setting. I find places like The Fat Duck, Noma and Vue De Monde build their esteem through inaccessibility, and this idea feeds into my own practice as an extension of that childhood craving for what you can’t have. I feel as though even the valiant attempts of replication cannot satisfy this craving, instead fuelling a sense of deprivation and desire. I don’t drink them myself but I can see the appeal as a source of ‘buzz’. When other people drink them, though, I find them to be more of an open declaration of determination, outstanding work ethic and efficiency. Like people trying to tell everybody around them and themselves that they are ‘on a mission’ or ‘burning the candle at both ends’ with something tangible and effective. I don’t know to what ends this corporate ethos is particularly effective, but I do find the marketing and branding of these ‘lifestyle products’ more interesting than the thing as a consumable beverage. Tell us more about the Food Jammers collective. Have you met them? They are three artists based in Toronto, Canada—Micah Donovan, Christopher Martin and Nobu Adilman. Unfortunately I haven’t met them but I am continually studying their work. They tend to enforce a ‘hack’ mentality and amateur inventiveness despite holding a strong understanding of the technicalities of more sophisticated machinery. They make things like taco vending machines, centrifugal pancake makers and ﬂash cooling soda carbonators—and the somewhat basic functions of their products generate a humor through their elaborateness and absurdly specialized industrial design processes. In their show, their deconstruction of existing machines, use of industrial materials, and the demonstration of their craftsmanship and problem solving all create a sense of play and even dry wit. I ﬁnd that this whole process correlates to a childlike ingenuity and inquisitiveness—l mean, despite access to better tools and a better technical skillset, they are ‘kids’ in that they are still rooted to that primal, uninhibited DIY building process that largely inﬂuences my own work. Within your contemporaries, whose work do you most relate to? Do you sometimes work collaboratively? Probably people like Andy Hudson, Michael Georgetti and Danny Frommer for their more playful kinetic work. I’m particularly drawn to the rawness of the mechanical processes in their work, and as a continuation of my ‘Food Jammers’ interest, the kind of visible crudeness in their mechanisms is something I also see important to demonstrate in my practice. More recently though, I’ve been working with lights and custom electronics partially inspired by the work of Ian Burns and Benjamin Forster. I relate to someone like Burns through that idea of combining readymade objects with custom supports and frames, and the way technology blurs with institutional mediations and contexts. Although I’m not necessarily trying to make ‘accessible’ work, I feel like I can harness nostalgia in a way that has the capacity to connect to a younger audience. I have not collaborated with other artists as of yet—further negotiations still need to take place. Tell us about the chefs you admire. There are a few… Locally, Ben Shewry and Nicolas Poelaert for their understanding of nature based cuisine. Internationally, Ferran Adrià for pioneering the molecular gastronomy trend and bringing specialized equipment and processes into broader use. Grant Achatz for his continuing technical development and innovation, as well his continued online presence and ongoing documentation of ideas. Michel Bras as a pioneer in developing the nature based cuisine now central to much of contemporary gastronomy. Then there are those like Wylie Dufresne and Massimo Bottura whose food is more eccentric and playful, often referencing childhood, low culture and traditional cuisine as culinary concepts. I think of, for example, Dufresne’s play on ‘eggs Benedict’ and Bottura’s ‘broken pie’ and ﬁnd that it shows a charming wit that characterizes their cuisine. Continuing on the ‘playful’ notion, Momofuku’s David Chang assisting informal dining back to a reputable status—emphasizing his simple but favorite term “delicious”. I also ﬁnd that Momofuku’s Christina Tosi really works on memory. While cereal milk, pretzels and popping candy may be arguably frowned upon as ‘lowbrow’, the use of these ‘low status’ culinary items within more traditional culinary conventions really assists in sparking memories and sensations typically so far from such contexts. Lastly I admire Magnus Nilsson of Fäviken, for the way he strictly adheres himself to new Nordic cuisine. His understanding of cuisine is incredibly complex, and the dishes have a purity in the way they are distilled from their concepts—one which immediately comes to mind is “A tiny slice of top blade from a retired dairy cow, dry aged for nine months, crispy reindeer lichen, fermented green gooseberries, fennel salt”. A real game-changer. Can you tell us about your unrealized projects? Your dreams? Your utopias? I would ideally like to build a chamber vacuum sealer machine. I’m currently working on figuring out the mechanisms involved and how I can recreate them using other machines and materials. Also, more simply, trying to push sound as a memory trigger is something I would like to extend upon. With my popcorn machine I am thinking of connecting a small radio microphone near it, then rigging it to the Raspberry Pi central control unit, and transmitting the amplified sound to nearby radios. Essentially, it would be a kind of surround sound popcorn experience. 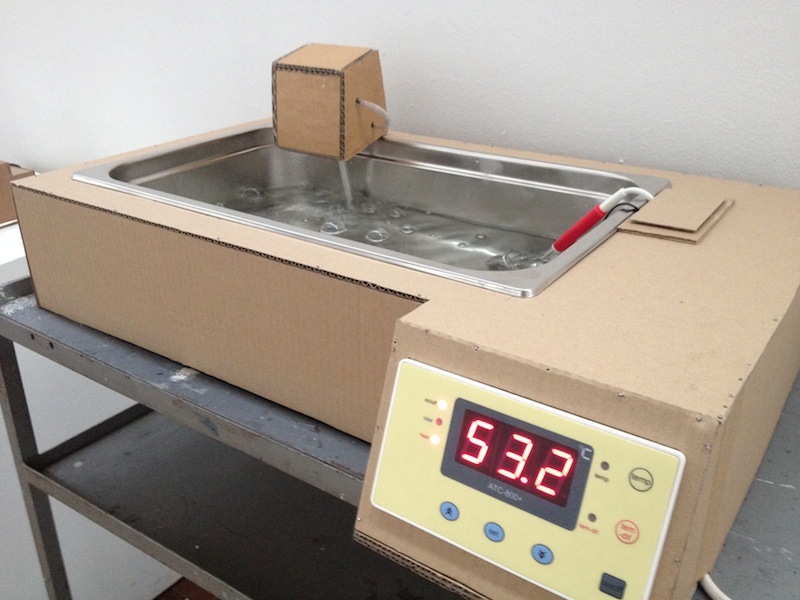 An ultrasonic bath is also in the works, and also an assemblage of Gastronorm trays and transducers controlled by a 2003 iMac G4. The readapted use of an ultrasonic bath after Modernist Cuisine means this equipment’s function has expanded to a process of ‘cavitation’ when vacuum sealing French fries, and I connect to this convoluted process very strongly. Maybe somehow I don’t fit the overly ambitious artist archetype of my generation—there is no concrete five-year plan or anything. Whilst still considering exhibiting in a formal setting like a gallery, I’m also considering other kinds of spaces to work in—particularly commercial contexts, as I feel they might strengthen the work in some way. With an interest in pop-up shops and industrial design, I’m thinking of assisting in fit out design at some stage, and perhaps this will also inform my work—I think of artists like Sasufi and Brodie Wood, who have work that sits comfortably between art and design, and feel like there are valuable associations to be drawn. Not working to the point of say, opening up a cardboard furniture store, but still operating outside of ‘producing art’ in some way, and hoping to find importance in a simple, satisfactory utopia. Being ‘happy’ in one’s environment is a somewhat simplified way of understanding utopia, but I hope through experiencing it in some way, it might open up to me a more complex idea of what utopia is. Where are your next exhibitions? What’s planned for 2013? I’m currently working with two other artists on an exhibition concerning craft, and while referencing its turbulent status in association with art, celebrating its continued presence and growing acceptance in fine art contexts throughout Melbourne—the working title being Kraftwerk: Ohm Sweet Ohm. I find there is a continuing hesitation to reference ‘craft’ directly in art, with a particular stigma and associated aesthetic still very much attached, and it is through craftsmanship that we hope to bring the debate back to the very essence of fabrication in general. More immediately, I’m looking to exhibit the popcorn machine at an artist-run space locally—something small and tight to really concentrate the scent of melted butter. Planning for 2014, I am currently negotiating with another artist a show that critically deals with the largely unformulated, yet rather strong relationships between art, gastronomy, and local pop-up culture. Their roles in the experience economy and as cultural capital are quite significant, particularly here in Melbourne. On the level of experimentation, working with sounds of heavy duty industrial materials like worksite radios and extraction fans in combination with consumer oriented electronics, further work with the Raspberry Pi microcontroller, and continuing to work through my main material of cardboard. Still no five-year plan though. Is your time-based art inspired by John Latham? How do time and art even relate? On a simple level, I feel like the implicit gap of time reinforced in nostalgic sentiments is a level through which I can engage with the viewer. Through referencing recreational activities of a bygone era, there is a certain ability to control emotional responses in that they act as involuntary triggers of memory. I see Latham’s approach operating similarly to the draw of nostalgia, be it through the more simple relationship between childhood and adulthood. I see the dual trigger of reflection and immediacy of nostalgic reference points as a way of flattening an overview of one’s own existence, trying to reveal to each individual their capacity to reflect on their progress and emergent character. Are you part a group of artists? A movement? As a Melbourne-based artist, although I am not in an artist collective per se, on a basic geographic level I still feel attached to a group. I think the sense of isolation outlined in the Provincialism Problem is no longer a constraint to the Australian art market with the advent of the Internet. Although, I feel like there is still a kind of marginalized mode of production here, with a noticeable consistency in aesthetic from dominant schools. Although perhaps these trends may not be specific to Melbourne, somehow informed by imagery from overseas even, but there is definitely a broader movement around the ubiquitous plywood plank, platform or object. But basically I’m wondering how these micro-aesthetic movements come to be formed. As for something like nostalgia, is such subject matter thought through collectively by way of multiple artists dealing with this? Or, from its nature, can it only be dealt with individually? Arguably it is not that simple, but it still seems required that people find taxonomical conventions to make sense of respective practices— such as ‘dealing with nostalgia’—in order to attempt an understand of the subject matter. In any case, is it still possible for an artist to function, or deal with their subject matter autonomously? Or are they immediately grouped or thematized? On that token, maybe I am in a group, just one that I am simply not aware of. Apart from some puns here and there, not really. I see a kind of poetry on the menus of some high-end restaurants, though. Here I mean, the complete lack of adjectives that has become a trend leads to some interesting linguistic outcomes, like one of Alinea’s dishes titled, ‘Lamb……..?????………….!!!!!!!!!!!!!!!!!!!’. The elusiveness of some descriptions really serves to heighten anticipation, also then concentrating on ‘total experience’ surrounding the dish, which in itself is a common characteristic of contemporary gastronomy. I see Michel Bras as important in this discussion too, as his food operates like poetry in some ways, or I guess transposing poetic conventions into the way the dishes are composed. I mean, with a dish such as ‘Gargouillou’, which has over 50 ingredients, each has its own importance in the syntax of the dish. It is also constantly changing, and I feel like this improvisation assists in defining this unique poetic language of food. Who are some Australian pioneers who influenced you? I think the two main culinary figures would be Ben Shewry and Shannon Bennett. Shewry I feel brought this notion of ‘foraging’ for food to a more widespread appeal in Australian cuisine, emphasizing a delicacy with nature through sustainable practices, and I think that getting back to basics plays an important role in my own practice. But also, more simply, they were both local examples who contributed in harnessing my interest in the specialized equipment and experience economy of high-end cuisine. Bennett really enforced that notion of ‘dining as experience’ here, for example using a coffee siphon to make bouillabaisse in five minutes. There is also that element of nostalgia inherent in Shewry and Bennett’s working process, though arguably to different ends, but both still using personal memories and experiences as a foundation for their work. For example Shewry’s approach centers around his New Zealand upbringing, whereas Bennett’s work moves to reference his childhood memories in a more playful manner, with dishes like “Lemonade and pop rocks” and “Lamington”. What role does chance play in your process? Well, I guess a lot of solutions I come up with are pretty chancy, with the engineering usually determined throughout the haphazard working process. There are a lot of creative decisions determined by just constantly shifting the plans and the structure as I make the work, and working predominantly with cardboard allows this kind of flexibility to take place quite easily. Rather than strictly defining the model for construction before making the work, #hacksolutions allow happy accidents and unforeseen technical hurdles to work together in strengthening the conceptual foundations of my work, and I find reacting instinctively rather than methodically really makes for some innovative technicalities. Did the computer or does the computer change the way you work? Despite having a pretty hands-on approach, I definitely still see computers informing my works, as most gadgets usually have. Though, through the Internet, I can sift through niche forums, video tutorials and sites about gastronomic and art culture trends, upon which content I heavily draw influence and technical skill sets, with a lot of the passionate amateur hobbyists on YouTube really influencing my working process. This instant transfer of information, too, really serves as a fertile platform of feedback, although quite swiftly and informally. Here, thinking of someone ‘following’ or ‘liking’ on Instagram as generating an efficient global circuit really makes for interesting new forms of valuation and critique of art, as simplistic as they are. On a more basic level though, I am pretty fond of word processing. When did you have or use your first computer? In 1993, a year after I was born. It was a Macintosh Classic, naturally. I have since then always used Mac computers. This is why I’m particularly keen to get out my old 2003 iMac G4 and incorporate it into my work somehow, with the nostalgia around outdated forms of technology interesting as an inevitable result of being raised in an era of rapid technological growth. How many young artists remember Kid Pix? Would you describe your reproduction of devices as reverse engineering? I think it definitely draws upon those principles in some way. The process reverses in the sense that a basic inquisitiveness and curiosity leads me to work backwards through mechanisms and functions, and then moves forward again in recreating hack solutions. I use self taught carpentry and engineering techniques, but translated wholly to cardboard-based structures, so a lot of it isn’t too easy to teach yourself as there is no foundational knowledge, compared to a practice revolving around wood or metalwork. But in looking at other materials, for example in the immersion circulator, I made the work carry out the same function as a $1000 Polyscience water bath but instead using an aquarium bubbler, water boiler, fish tank temperature controller, so that reverse engineering and hack solutions were pretty significant in that process. I feel like this sort of amateur reproduction of specialist equipment is amusing in its potential failure, and also absurd in its means of continually attempting to generate alternative mechanical systems. What devices does a contemporary home kitchen need? What device would you like to invent? It depends on the type of user really. I mean someone who is all about quick-’n’-easy meals probably won’t braise meat at 60° for 2 days. So, whilst I think the Immersion Circulator is an incredible piece of equipment that should be brought into wider use, I still think it remains a step too far for home kitchens at this stage. I think that the divide between home cooking and restaurant cooking will still continue for a while, despite various books by Noma, Faviken and Alinea revealing more complex and involved processes, which wouldn’t necessarily feature in more ‘accessible’ cooking texts. Although, this argument for ‘accessibility’ bores me a bit, as it implies a ‘fail proof’ method but also manages to bypass even the most basic techniques—here I think of microwave egg poachers and the ‘slap chop’, which seem to complicate a fairly simple process, despite their promise for ease and efficiency. You know, these consumers could really learn a lot by simple trial and error, which is a working method I’m not only fond of, but which I feel can lead to ingenious breakthroughs. On a basic level, you can really do a lot with a knife, some burners and some pans, but a lot of punters even resort to that easier chopping alternative. So in that sense, I think these sorts of products have potential to inhibit creativity to a certain degree, although, they also hold the capacity for new adapted functions. Like the El Bulli 40-second microwave sponge technique, which is a legitimate technique within high-end contexts. I mean, despite the sort of over-designed nature of these products, I think they can hold host to more creative outcomes, with the application of a more creative technical mentality. In saying all that, though, I hope that the Immersion Circulator becomes as ubiquitous and domesticized as the rice cooker, or the electric kettle. Personally, I’ve thought about making a sort of small-scale meat-smoking device, but I don’t know how economically or ecologically sound my solution to the project would be. Do you listen to music while cooking at home? Do you cook at home at all? What do you cook? Not at home, but during the ramen pop-up we were cranking some Kraftwerk during prep and service and that really came to suit the whole experience. I mean, the cross cultural appropriation in reinterpreting ramen was echoed somehow in Kraftwerk’s music, in that their translation from German to English lyrics didn’t always make quite perfect sense. I liked the way it made a kind of self-deprecating setting in which to experience the noodles, with the self-aware irony in white dudes cooking their own ramen really pushed to the foreground. On a day-to-day level though, I usually stay in the studio late during the week, or I’m cooking in a commercial kitchen on weekends, so my own meals are relatively simple, like bread and cheese and cured meats. Although I want to spend more time with my charcoal BBQ—there is something very primal about cooking over coals and fire, and smoke is the greatest seasoning of all. Maybe this carnivorous attitude doesn’t make me necessarily sit in with the vegan/gluten-free artist archetype so typical to Melbourne, but anyway. I think this interest sits within the trending rediscovery of ancient cooking techniques within international gastronomic circuits; you just have to look at Magnus Nilsson’s dish of bone marrow cooked over coals, sawed in half to order. What is your favorite recipe? Your dream meal? Pig. It’s on trend for a reason. Whole suckling pig cooked over coals would have to be pretty close to my version of gastronomic perfection. As for dream meals within existing restaurant settings, I would love to have the opportunity to dine at Noma, Alinea, Momofuku and WD-50. These places are indeed a class above in the experiences they present. What do you consider the most inspiring occurrences of meals/food preparation in art history and cinema? In the lyrics for his “Boyfriend” hit song, teen idol Justin Bieber describes a moment “Chillin’ by the fire while we eatin’ fondue”. The Guardian identified it as one of the “Five Signs that [he] might be losing it”. What do you think it says about the gastronomy trends of the 89plus generation? I haven’t heard the song, but I had a look at the lyrics, and I’m not certain if this is just a simple lyrical gap-filler or if it aims to comment deeper on the gastronomic experiences of a ’90s child. I have fond memories of ‘chillin’ by the fire’ but I cannot say I have had the luxury of eating ‘fondue’ by the flames. In terms of practicality, I can’t really see fondue being suitable for a campfire setting at this stage either. Although if I really had to tug at the relationship it has with broader phenomena of gastronomy, perhaps it is simply the way mainstream products have capitalized on the informal and playful childhood experiences with food—I’m thinking here of those ‘ready-to-share’ chocolate bars, lollies and ice creams. But also, I think an entire form of cuisine from this has become more mainstream and accepted, and not simply a gastronomically frowned upon novelty. In saying all that though, I’m pretty sure he be ‘eatin’ fondue’ because it rhymes with ‘you’. Do you have pseudonyms? Raoul Vaneigem told us it’s urgent to have pseudonyms. Well, I’m on Instagram @bpnoonan, so this is the closest thing I’ve got. It’s my online pseudonym. I see web presence distinguished from physical reality and engagement as quite an interesting shift for the art community, and I feel like the only notion of ʻpseudonymʼ people really have now is from their online profiles or avatars. In terms of scale, the extractor hood has been by far the largest. Although in terms of time spent engineering, starting with mechanisms from scratch in the popcorn machine is proving quite time-consuming and labor intensive at the moment. But if I’m thinking about time spent troubleshooting, I would have to say the immersion circulator was quite a heavy task—convincing staff that something self-manufactured combining water, cardboard and heat was safe enough to exhibit, while not electrocuting myself in the process, was a little difficult. Outside of process sketches, one work last year titled ʻ63/63ʼ was a series of works made by vacuum sealing frozen ink with 10x10cm pieces of paper in plastic, and then placing it in a controlled temperature bath of 63 degrees for 63 hours. This work was a direct response to the sous vide technique, and was one of the ﬁrst works I made that dealt directly with gastronomic processes. Not really. Perhaps I don’t match that ʻdrawerʼ archetype compelled to draw 24 HOURS A DAY. My approach to it is pretty methodical and controlled. Drawing for me acts like a tool for developing and analyzing technicalities that arise in the process, although in saying that, there is still that unconﬁned doodling aspect in the freehand execution of my drawings. So I do enjoy that prosaic ʻpen on paperʼ but don’t feel an urge to scribble all the time. What’s the newest work you created yesterday OR TODAY? A 1.2m wide diffused ﬂuoro ballast within a bespoke cardboard frame. 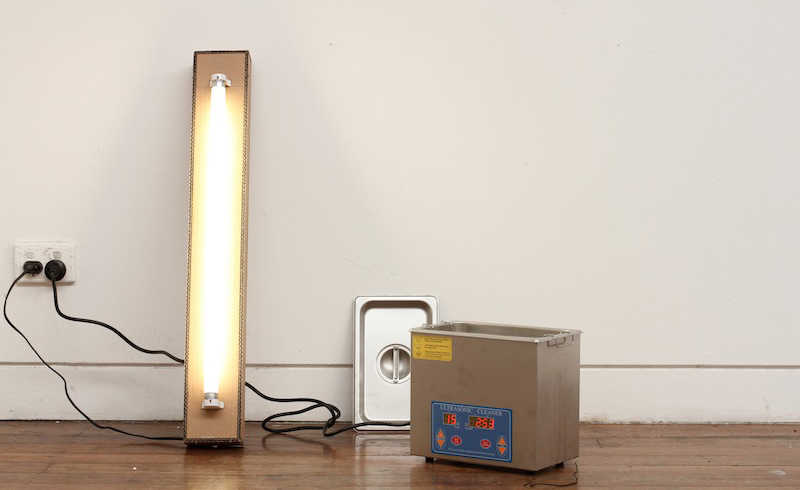 Iʼm not sure whether Iʼll be using it for the extraction hood, or just alone on brackets, but I feel the ﬂuorescent tube’s ubiquitous presence in both kitchens and contemporary art spaces is an interesting parallel. I think MONA in Hobart, Tasmania, with the juxtapositions it draws directly with old and new art being quite an interesting vision. It proposes a re-thinking of traditional museological display, and by drawing on these conventions reveals something about the very nature of contemporary art today. Some nights in the ramen pop-up shop, when I was working 16-18 hours a day, I started to dream about ramen too, and it was great. Relating that experience to something like that film, Jiro Dreams of Sushi, with a figure so wholly dedicated to his craft, is a continued point of fascination for me, and one that I feel demonstrates a rich commitment to oneself and their practice. Tell us about an exhibition that inspired you. In the Telling by Ian Burns. He constructed a series of kinetic sculptures imbedded with small cameras generating real time video works. Also through lights, glass, powerboards and other industrial materials, his playful manipulation of complex engineering and electronics was, for me, quite wonderful to experience. That whole relationship between heavy processes and a lighthearted encounter is a duality that Iʼm really trying to work with in my practice, particularly in the popcorn project. Do politics and art mingle? I think they definitely influence and inform each other. I feel like Boris Groys puts it pretty well in that “the goal of art, after all, is not to change things. Things are changing by themselves all the time anyway. Art’s function is rather to show, to make visible the realities that are generally overlooked.” So here, while politics really works to effectuate change, artists tend to focus on the processes of such change, and the resulting impact of such changes. But they definitely overlap—art influences and is at the same time influenced by politics. Because of this, I still find ‘political artist’ a pretty loaded label, and I can understand why artists are pretty hesitant in adopting this stance, as it does seem slightly tautological. Bill Noonan met with Hans Ulrich Obrist and Simon Castets in Melbourne, Australia for the 89plus interviews series thanks to John Kaldor Public Art Projects. 89plus is an international research project inquiring about the generation of creative minds born in and after 1989. Hans Ulrich Obrist is the co-director of the Serpentine Gallery, and co-curator of 89plus. He is based in London. Simon Castets is an independent curator and co-curator of 89plus. He is based in New York. Artist Bill Noonan met with curators Hans Ulrich Obrist and Simon Castets in Melbourne, Australia for the 89plus interviews series to discuss food, chance and immersion circulators.